This article by Richard J. Skelly was prepared for the December 14, 2005 issue of U.S. 1 Newspaper. All rights reserved. Musical duo Virago mix ethnic melodies and rhythms with original songs, roots-rock, folk songs and blues to create their own unique gumbo of musical styles in their performances. The Freehold-based duo of Maire Tashjian and Amy Schindler give a compelling show as they lead the audience on a geographical musical journey to places like Brazil, Haiti and other parts of the Caribbean, Central America and Mexico, and back to the USA. Tashjian plays a variety of drums and percussion instruments, while Schindler plays guitars and some percussion, too. Tashjian is a Freehold native who still lives there with her partner, Amy Schindler, who was raised in Long Island, and Tashjian's mother, Elaine, a visual artist and teacher. "I took to the drums at a young age, and I remember playing whenever I could," Tashjian says in a phone interview. When she was very young, her mother got her a conga drum. "It was like a toy that I played with all through grade school. I kept it up in high school and played in the marching band. I didn't start getting into ethnic percussion until 1993, when I studied at the Omega Institute in Rhinebeck, New York, for a two-week summer session." While at Omega she got to know legendary Nigerian drummer, impresario, and bandleader, Babatunde Olatunji, who led a group called Drums of Passion for many years. The late Olatunji, says Tashjian, "taught me the language of the drum and how to speak it. He was very encouraging to me to take it back to the community and share it. That's what I've been doing since then." Tashjian credits her mother for encouragement. "From the time I was eight, she was encouraging me to do what I wanted to do. That turned out to be drumming." Tashjian and Schindler have been working together as Virago since 2000. They performed their first Virago concert at a benefit for a battered women's shelter at Ramapo College in Mahwah. "There was a musical spark right away," Tashjian says. "I hadn't worked with anyone else in a while, and Amy was doing the same thing, and we hit it off. We shared a passion for Brazilian music. She had done some percussion as well, even though guitar is her main thing. "Virago is all about using our music to build community," she adds. As part of the after-school program in North Brunswick, the pair teach ethnic drumming to children one day a week, and they have a variety of other educational presentations they deliver to school-aged audiences. "Amy goes to one school and I go to another. It provides an opportunity for kids to experience hands-on percussion. They also learn about different cultures and why drumming is important to these cultures." The duo also work for Contemporary Music Studios, which operates out of the Freehold Music Center. Tashjian teaches drums and percussion while Schindler teaches guitar. Like so many other folk-based musicians, the two have discovered the advantages of a steadier income by pursuing school presentations. Virago's presentations are interactive; kids are encouraged to play the two dozen percussion instruments Tashjian carries with her to shows. Schindler was raised in West Islip, New York, and spent six years in the Army Reserves. She graduated with a bachelor's degree in music from the Long Island University C.W. Post campus. She has been playing guitar since her early teens, inspired initially by Nancy Wilson from Heart, she says. "She inspired me initially, but later I discovered people like Jimmy Page, Jimi Hendrix, and Eric Clapton. After I seriously began studying, I got into jazz performers like Wes Montgomery and Joe Pass. With our shows, I try to keep a soulful edge to my playing, and what attracted me to Joe Pass was I heard some blues lines and country picking in his playing as well." The late Pass, born in New Brunswick and raised there and in New York, made a name for himself in the jazz world, issuing dozens of recordings for a variety of jazz labels. Tashjian and Schindler traveled to Brazil in June of this year, where they spent several weeks performing and studying with Emeria Biancardi. Virago first met Biancardi at a women's drum retreat in upstate New York. "We had a first-hand opportunity to learn Brazilian percussion styles at the Festival of Sao Jao, a time when people come out to all these festivals from the interior. We had the chance to hear and learn all kinds of different folk music forms that were being played," Tashjian says. Aside from all of their school-based programs, "we've also been doing a ton of gigs lately," says Tashjian, who majored in performing arts at Brookdale Community College in Lincroft and studied at the Drummer Collective in New York City. The duo frequents ethnic restaurants at the Jersey shore, including Casa Solar in Belmar and Mira Sol in Sea Bright, a Portugese restaurant where Virago will perform on New Year's Eve. In concert, Virago cover the gamut from Brazilian standards and pop songs to Spanish ballads and Latin influenced music, with a smattering of American blues and roots-rock thrown in. "Our originals could best be described as a unique sound of rock with an ethnic twist," Tashjian says. "Our live shows these days are made up mostly of our original songs; it's a good feeling when we can play our own music and find audiences that are receptive to it." At the Mine Street performance Tashjian says, "We're going to do originals from our album called `Here Be Dragons,' and we'll likely have the audience participate in a samba or something like that. They'll also be encouraged to participate with percussion instruments that we'll pass out to them, just like we do with our children's' programs." This page is published by PrincetonInfo.com -- the web site for U.S. 1 Newspaper in Princeton, New Jersey. Maire Tashjian is happiest when she is hitting things. Not just any ol� things, but drums and other percussion instruments, including congas, ganzas and agogobells. So when Tashjian, 43, of Howell is part of a drumming circle, she is overjoyed. "It's empowering," said Tashjian, who formed the Onespirit Community Drumming Group in 2001 to satisfy that urge. "You become one when you drum together." The group of female musicians meets every other .Sunday evening at the Monmouth Council of Girl Scouts' Camp Sacajawea, Route 524 in Howell, where they rent a cabin on a small lake. Onespirit has about 15 regular members. But guests -- including children and, occasionally, men -- often sit in on jam sessions, Tashjian said. The age of members ranges from the early,20s to the mid 50s. The group has attracted drummers from throughout the state, plus one member from Long Island. "The door is always open to new members," Tashjian said. Tashjian works as a percussion teacher at the Academy of Allied Health and Science in Neptune, and also at the Around the Corner Art Center in Freehold. She has been drumming most of her life, she said. ."
During Onespirit sessions, visitors to Camp Sacagawea ethnic drumming patterns originating from places such as Haiti, Brazil, or Africa. By candlelight (campfires take too long to build), Onespirit layer beats on top of beats and perform a rhythmic game of call and answer, Tashjian said. "It's very primal," she said. Onespirit member Amy Schindler, 38, of Elmont, N.Y., appreciates the willingness of the group to integrate various drumming sounds. "It�s about playing whatever moves you," said Schindler, a private guitar and percussion teacher. Schindler said the sessions allow women to express themselves. "You get to see women come out of their shell," she said. "It raises everyone's energy level, and we focus on having a good time." Tashjian, who also performs with Schindler in the rock group, Virago, said she formed Onespirit after attending The Catskill Mountain's Women Drum Happenin' in Accord, N.Y., a few years ago. Tashjian said the four-day drumming retreat inspired her to create her own local group. "It was an amazing experience," she said. "It truly moved me". Soon after the retreat, Tashjian began recruiting members. Now, in addition to its semi-monthly meetings the group has performed at weddings and community events. On Monday, Onespirit will perform at Farmingdale�s Memorial Day Parade, which travels north Main Street beginning at 1 p.m.
Maire Tashjian met Amy Schindler at just the right time in both their lives. They happened to be on the top of a mountain in Wanaque in September 2000, participating in a Lakota-style Inipi ceremony, a meditative ritual that involves a sweat lodge. Schindler of Long Island was an experienced participant. In fact, she was a "fire keeper," someone responsible for maintaining the fire and preparing and guiding novices. But she hadn't attended an Inipi ceremony in a while: Work had been busy and she was recovering from a broken heart -- lots of mundane life stuff kept 'her away. "I was actually filling in for someone that night," Schindler recalled. "I hadn't planned to go, but they called and asked if I could go." Tashjian, who lives in Freehold, was a first-timer. She had just reached her 40th birthday and was doing a lot of soul-searching. "I wasn't happy," she said. "I was starting the second half of my life, and I didn't want to be a servant for money. I was making good money as a massage therapist, but my creativity was suffering. I went to this ceremony to try to find some peace." Tashjian met Schindler met on that mountaintop and there was an instant connection. "She cleansed me with sage before the ceremony," Tashjian said, "and she said, 'I know you. Aren't you a drummer?' "
Indeed, Schindler had seen Tashjian perform on her surdo, a Brazilian drum, in Ocean Grove. Schindler was a guitarist herself, searching for a female drummer willing to explore different kinds of music. Schindler hadn't been in a band for a while and was feeling restless. In fact, she had signed up to perform at an upcoming "Womyn's Music" festival -- with no band mates, no prepared songs. She figured if worse came to worse, she'd just get up on stage and play solo. But there was Maire - a drummer. Two weeks later, the two were performing as Virago at the festival, which was a benefit for a battered women's shelter. That chance meeting was a turning point that led to major changes for the two women. Tashjian has since quit her job, vowing to make a living .by teaching drum and performing in Virago. Schindler, already a music teacher, is in the process of relocating from. her native Long Island to the Jersey Shore so the duo can finish their debut album and begin touring. They have performed at the Clearwater Festival in Asbury Park, and at the Red Bank Jazz and Blues Festival. They frequently perform at clubs like the Internet Cafe in Red Bank, where they'll playas part of First Night on New Year's Eve, and The Saint in Asbury Park, where they'll next play Jan. 11. This year, both received "Meet the Composer" grants from the New York Council on the Arts. The women are a study in contrasts. Tashjian is tiny, with a deep, mellifluous voice and a big smile. Schindler is tall and rangy, long-haired, tattooed. She considers herself shy, despite her aggressive stage presence. Tashjian made her surdo from folded plywood, and her mother, Elaine Smith, painted a toucan and flowers on it. Tashjian formerly was a member of M'Zume, a samba percussion ensemble. Schindler played bass in punk bands and various instruments in the U.S. Army marching and jazz bands. 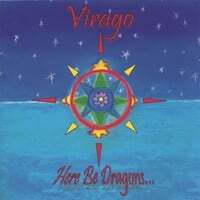 With Virago, they have both gone from playing in large groups to the intimacy of a songwriting duo. Like motorcycles, slender little vehicles that make a racket as they drive by, Tashjian and Schindler cook up a lot of noise for a mainly acoustic duo. Tashjian marches up and down, with jingle bells around her ankles, while pounding the surdo and accenting the beat by raising her arm. Schindler wails on the guitar and sings in the howling, growling Janis Joplin-Melissa Etheridge tradition. They write and rehearse together in Tashjian's mother's boyfriend's house, tucked in Highlands, with glass walls affording panoramic views of the town below, of Sandy Hook Bay and the New York City skyline. "This whole journey's been serendipity," Tashjian said, "I'm so much happier since I met Amy and we started making music like this." "I do think that it all comes down to courage and putting yourself into the void," Schindler said, "If I hadn't agreed to perform at that benefit, and if I hadn't been forced to take a chance and ask Maire to play with me, I might .still be waiting to begin Virago." In Virago, Tashjian and Schindler have found the perfect. outlet for their music. In each other, they have found their muse. One of their favorite songs is "She's All That," inspired by a photo of Tashjian at 19, striking a pose in front of a hot rod. Schindler thought the photo was endearing and funny, and so unlike the demure drummer she knew. So she wrote a song about Maire at 19. "So I said, 'I know how the story ends,'" Tashjian said. "And I finished the lyrics." How did a nice Irish woman like Maire Tashjian of Freehold become enamored with Brazilian samba, Afro-Cuban and West African drumming? It�s a long story, she'll tell you, but Tashjian began playing drums in the Freehold High School Marching Band. Ever since she was a teenager, her passion for and knowledge of an assortment of drums and drum stylings have been growing, she said. Tashjian leads Onespirit, a percussion ensemble that performs Sunday at Turkey Swamp Park Day in Freehold Township. Last August, at the Clearwater Festival in Asbury Park, the female drum ensemble made waves with its unique polyrhythmic. patterns and songs from Brazil, West Africa, Cuba and other exotic! places. The band played its first official show at the nearly rained out Farmingdale Memorial Day Parade, Tashjian recalled during a: recent rehearsal in the basement of the Howell Human Services Center. Since her obsession with drums :began, Tashjian has studied and performed with Brazilians Ivo Araujo, Amelia Biancardi and the late African drum master Babatunde Olatunji. Onespirit grew out of a drum circle Tashjian leads at Camp Sacajawea, a Girl Scout camp in Howell. "I worked on this idea for a while," Tashjian explains after a recent Wednesday night rehearsal, which: included all artful rendition of Sergio Mendes and Carmen Alice's "What Is 'This?," long a staple on Brazilian radio. "I've been into drumming since high school and then got interested in hand drumming in 1993,�' Tashjian said, "in 1996 and 1997 I started performing. I loved the rhythms and the culture behind the rhythms, and I loved the arraignments," she said, noting Amy Schindler, her partner in Virago, a folk duo, will add guitar or flute treatments to the sound of six or seven drums beating out rhythms. "We have the foundation for our music with the percussion, and then Amy will play cavaquhino (a small Brazilian guitar) or flute on top of that. You don't often see that. in a percussion ensemble,� Tashjian added. Onespirit also makes use of a variety of whistles as well as ankle bells, the African djembe, Brazilian tamborim, congas, caixa, a Brazilian snare drum, and the cuica, a drum played with a damp rag. The cuica is featured prominently in Simon and Garfunkel's "Me and Julio Down by the Schoolyard." Members of 'the group include Schindler and Tashjian, both of Freehold Borough; Wendy: Halley of Toms River; Liz Hartwell of Highland Park; Andrea Lindlau of Point Pleasant; Agnes Marsalla of Bordentown; Ellen Bradfield, Middletown, and Mildred Iezzi, Ocean Grove. The group hopes to be doing more educational, in-school performances, but because of the realities of getting eight. conflicting schedules to mesh, Tashjian and Schindler often perform in schools with a smaller group. "I do percussion workshops and performances in schools, but in order to play out," I wanted to have my own group," Tashjian explained. Asked what each member gets out of being apart of Onespirit, Bradfield, Middletown, said she gets a feeling of accomplishment, "the feeling that I can do something and play drums, because I went through life thinking the only thing I could play is my stereo." Ocean Grove�s Iezzi, a massage therapist, said, "I've always had a dream of being a drummer in a band and I always loved Afro-Cuban music and rhythms." Halley, a Toms River resident who works at the Howell Human Services department, Said she always wanted to sing, "but I didn't really start playing drums until. I was drawn into this drum Circle. I'm a Student of Shamanism, so I do indigenous healing techniques, going into trance and getting in touch with the spirits so they can do healing." "Drumming is an ancient way of going into trance, and all cultures have this, a way of calling the spirits, and that's what originally drew me into the circle, because these women were kind enough to drum for me while I did healing," Halley explained. Asked if her plan initially was to exclude men from the group, Tashjian said no. "I feel it this way: Women need to reclaim that part I of them, because in. pre-Christian times, women were the drummers," she argued, "there's: a great book by Lane Redmond, 'When the Drummers Were Women� and it wasn't until Christianity came into being that all that changed." In the process of rehearsals, Tashjian, Schindler and others in Onespirit realized they had something unique because they were all women. "We realized .it was unique, so we've kept it all women," Tashiian said. Halley added: "Eight chick drummers, how cool is that?" "In a drumming group, things tend to get louder. Since guys are stronger, they can play louder," Schindler pointed out. "In my own experience, drumming is uplifting," Tashjian said, "It takes me out of my own head." "In the future, we do hope to have a men's auxiliary," Schindler added good naturedly. We play Private Parties, Colleges, Clubs and Festivals!